China imported more than $130 billion in U.S. commodities in 2017, according to U.S. 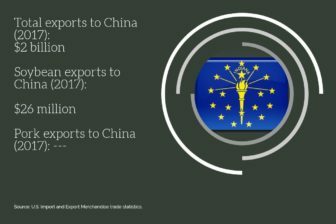 Import and Export Merchandise trade statistics. 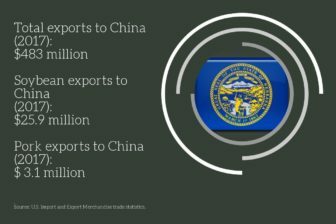 Earlier this month, the United States and China both announced billions of dollars in taxes on billions of dollars worth of imported goods – China is seeking tariffs on $50 billion worth of U.S. products that include soybeans and pork, while the U.S. announced taxes on $150 billion worth of 1,300 Chinese products, including electronics. Here’s a look at what farm organizations in the Midwest have to say. Farmers and ranchers are, by necessity, patient and optimistic, says Kansas Farm Bureau President Richard Felts who farms in Montgomery County. Markets ebb and flow but China’s threatened retaliation against the U.S. tariff proposal is testing both the patience and optimism of families who are facing the worst agricultural economy in 16 years. This must stop. 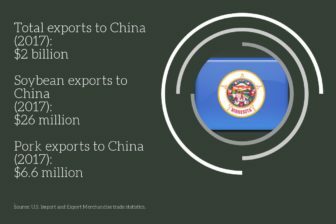 "On (April 2), the Trump Administration announced a second round of tariff increases on goods imported from China. These tariffs will take effect in 60 days. On Tuesday, China proposed tariffs against numerous goods imported from the U.S., including soybeans, cotton, corn, wheat, sorghum, and beef. Pork exported from the U.S. to China was already covered by recently announced Chinese tariffs. "If fully implemented, these actions spell trouble for Missouri agriculture producers. 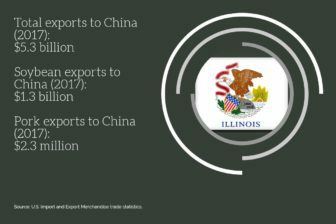 China is by far the leading destination for U.S. soybeans, with the country buying nearly two thirds of all U.S. soybeans exported, and one fourth of our total crop. A recent analysis by agricultural economists at Purdue estimated that a tariff regime similar to the one proposed by China would see an overall drop in U.S. soybean exports of 40%, with economic losses to the U.S. economy of over three billion dollars. 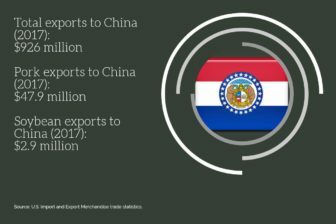 That figure doesn't include the economic costs of lost sales of pork, corn, cotton, and beef, all important products for Missouri agriculture. "Farm prices are dropping in response to the announced actions at a time when prices are already at break-even or below, and farm income is forecast to be lower than at any time in the last twelve years. "It is hard to remember a more potentially calamitous week for U.S. agriculture. "China is a bad actor in international trade, and their total disregard of U.S. intellectual property rights and their habitual disrespect for the accepted norms of international trade must be addressed. It is important to remember that the actions announced by both China and the U.S. don't take effect immediately. There is time for an agreement that can both satisfy U.S. farmers and protect U.S. companies and employees who have suffered because of past Chinese actions. "The Trump administration has entered into a high risk policy, one that can bring great benefits to our citizens, but one that is fraught with danger for farmers and the U.S. economy. The costs of failure will cripple agriculture for a generation. There is one thing for certain: Round after round of increasing import taxes between our two countries will make everyone poorer. There is no winner in a trade war without a negotiated peace." 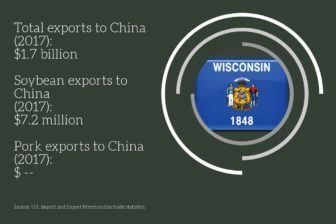 “Wisconsin farmers greatly benefit from trade. Wisconsin Farm Bureau has been a long-time supporter of open markets and fair trade because our farmers can and should be able to compete in a global market place.